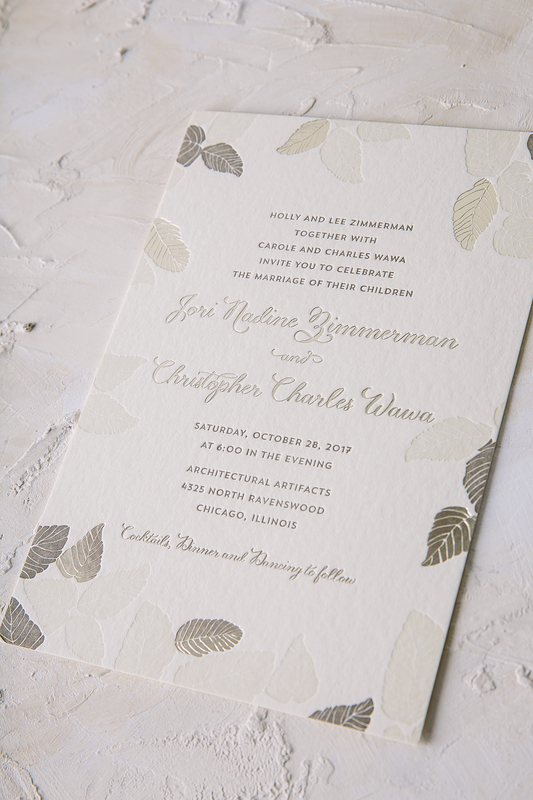 Justine and Jones took our Bloomsbury design and made it into something completely their own for their October affair. 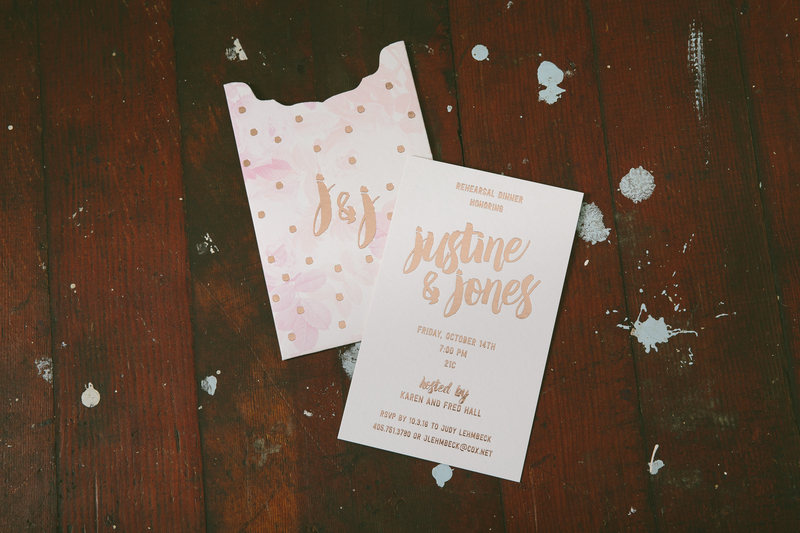 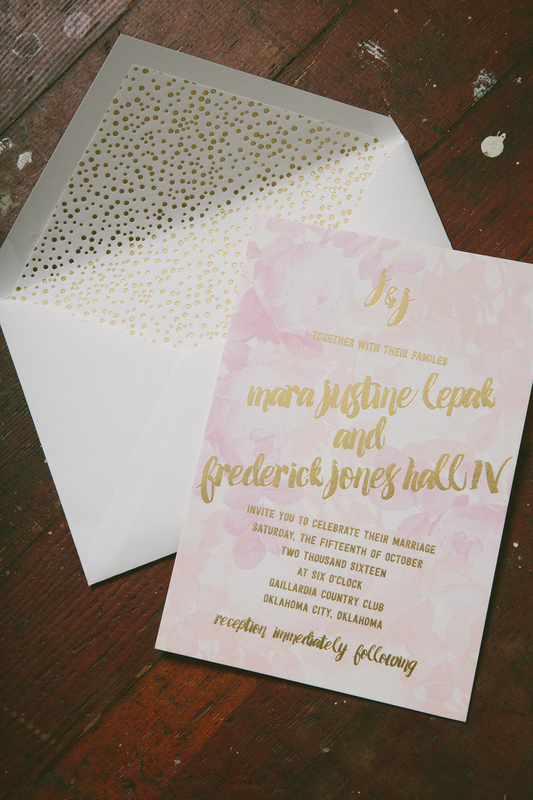 These playful watercolor wedding invitations were printed in our Gold Matte foil with dreamy florals added in a palette of pinks as the backdrop. 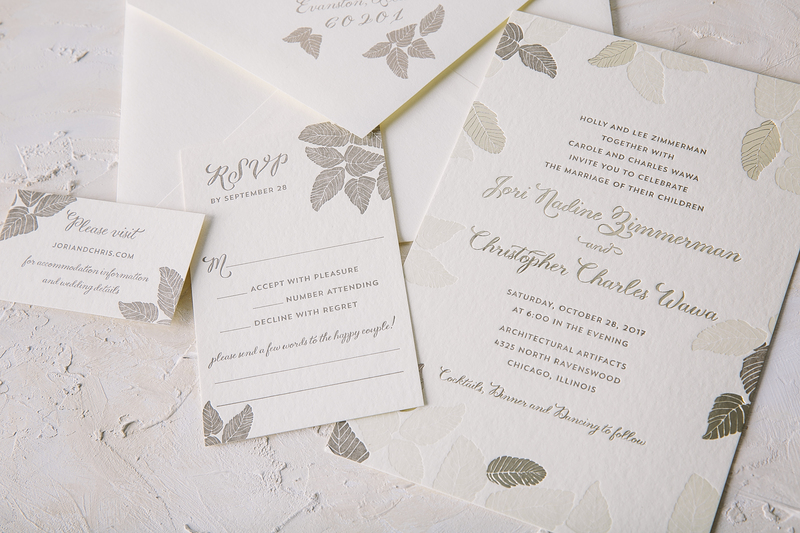 To include a little bit of whimsy, foil stamped polka dots were incorporated throughout the suite. 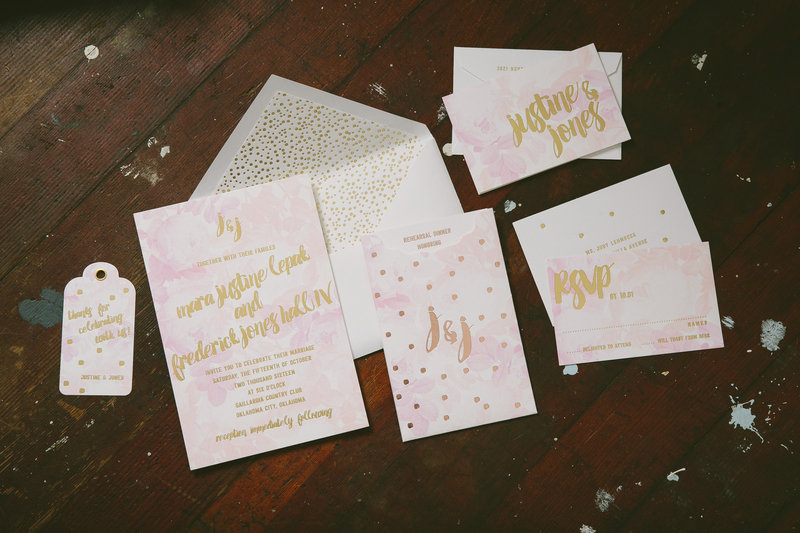 The rehearsal dinner set was kept safe and sound in a corresponding sleeve to give the set a little extra dose of individuality. 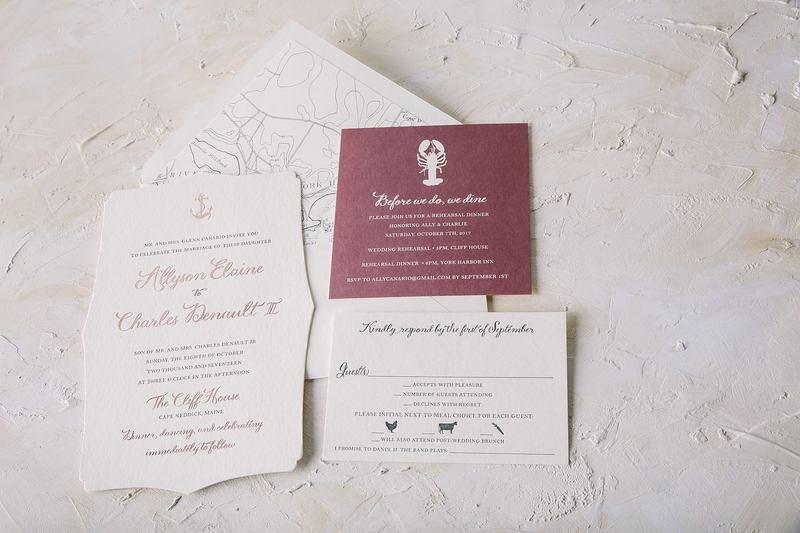 Guests will be pleasantly surprised to find this same theme carried onto the welcome tags and thank you set as well. 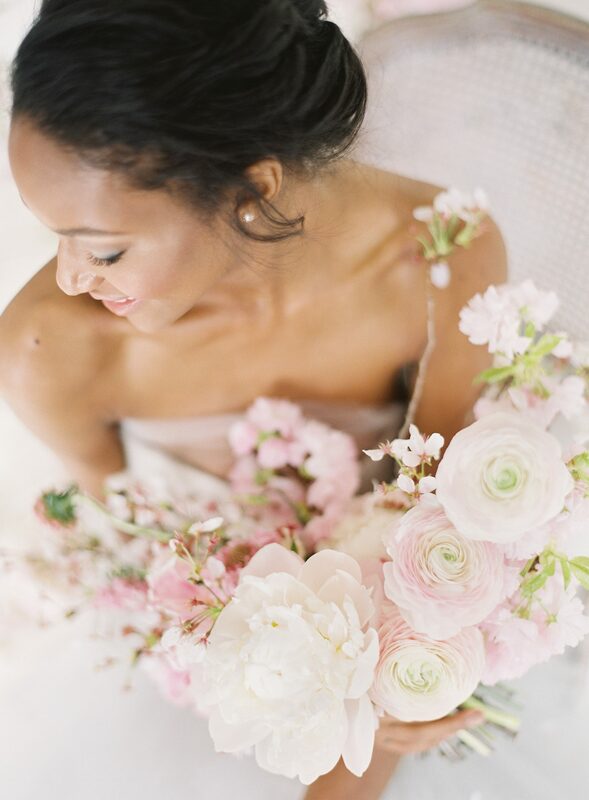 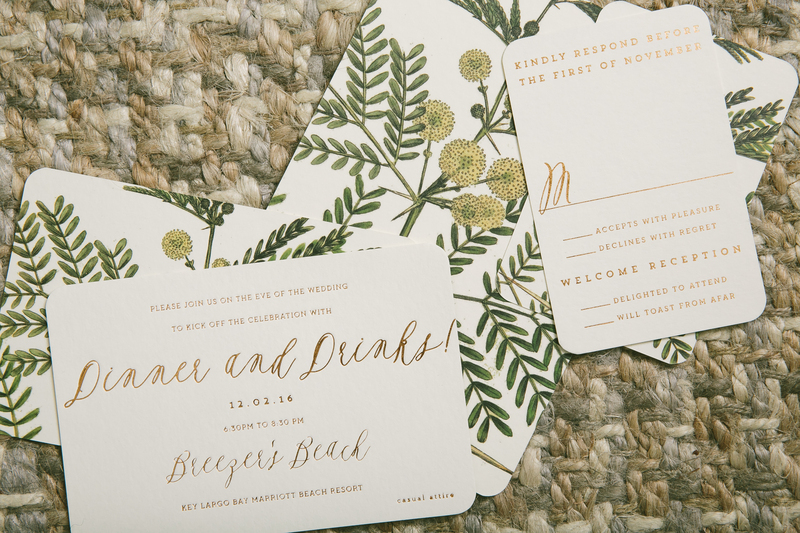 This spirited set wouldn’t have been possible without the help of No Regrets- OK and we have no doubt the wedding of Justine and Jones came together just as beautifully as their suite. 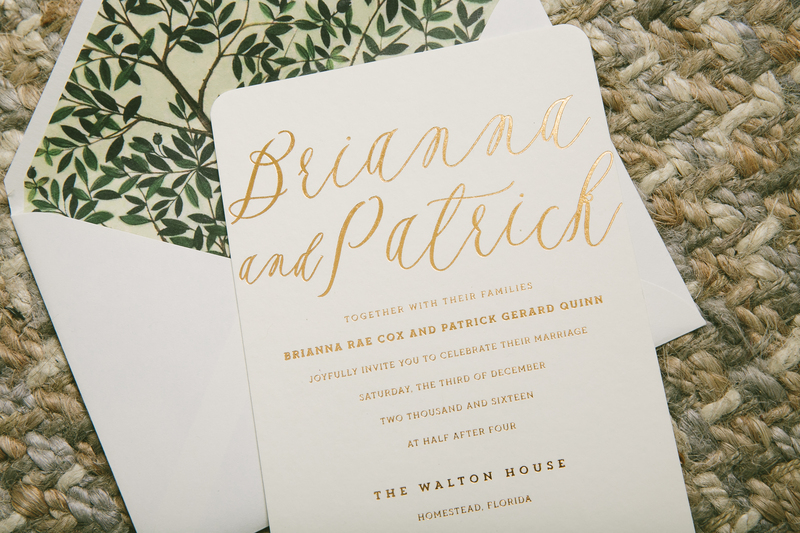 We customized our Ellory design to fit Brianna and Patrick’s wedding at The Walton House in Homestead, Florida. 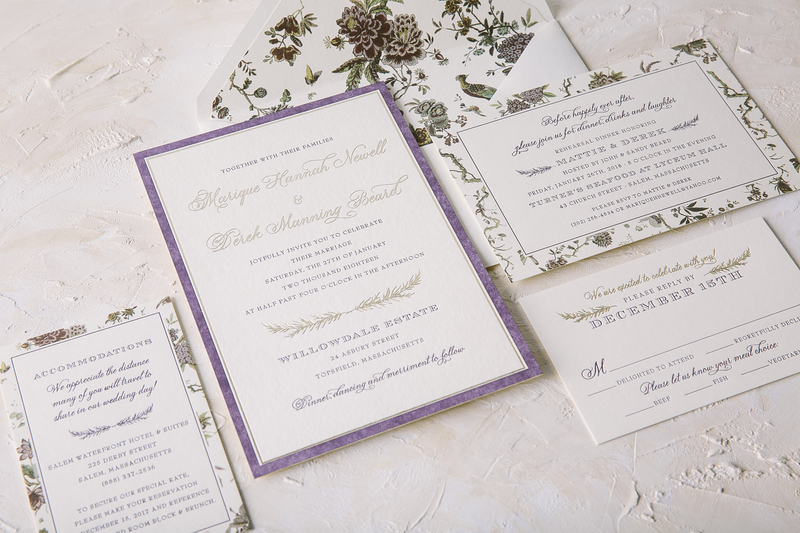 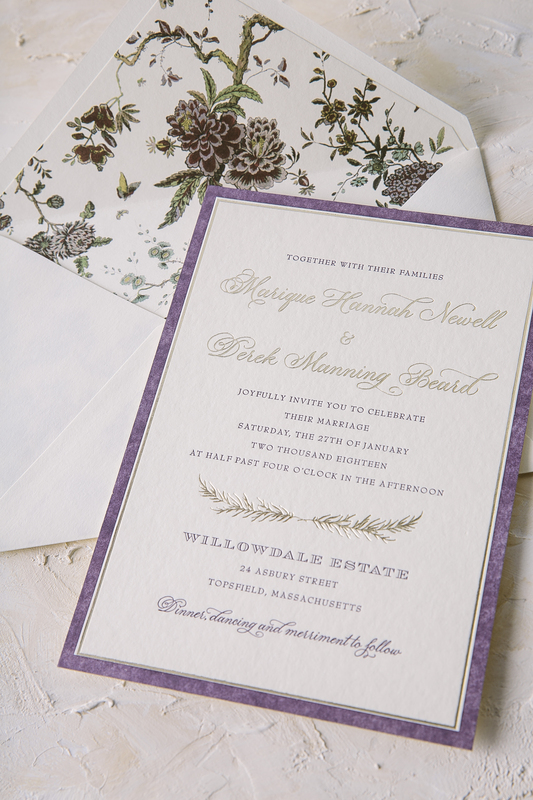 Thanks to the help of our friends at Stationer on Sunrise, these botanical foil stamped wedding invitations reflected their venue perfectly with images of greenery incorporated that can be similarly found on the property of The Walton House. 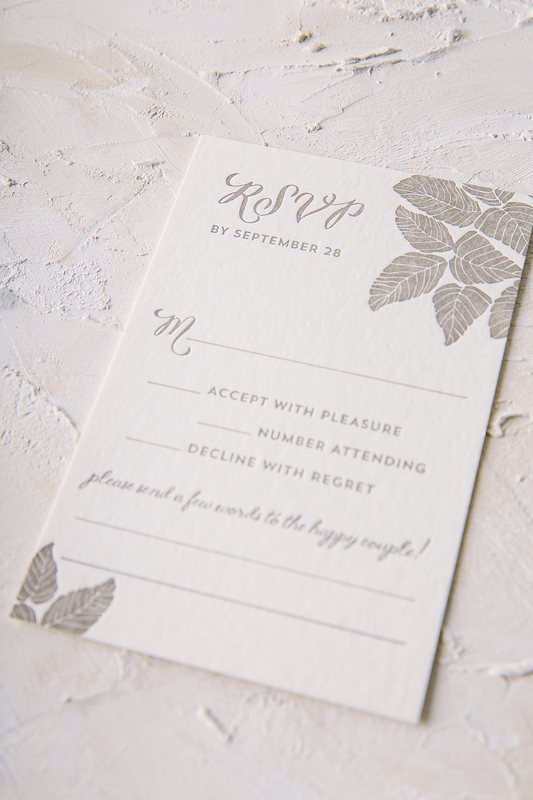 The suite contained corresponding reply, reception and website cards to complete the package, all with rounded corners for a softer overall aesthetic. 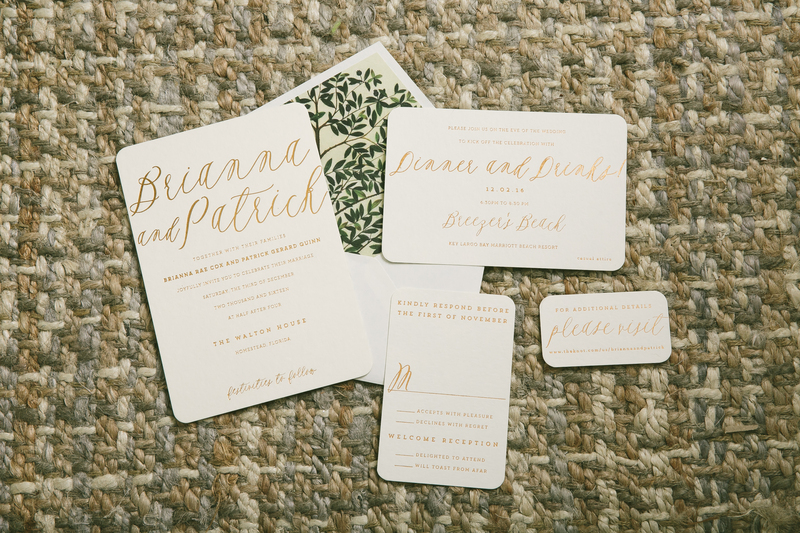 On the flip side of these cards, guests will be pleasantly surprised to find more traces of greenery, tying everything together perfectly. 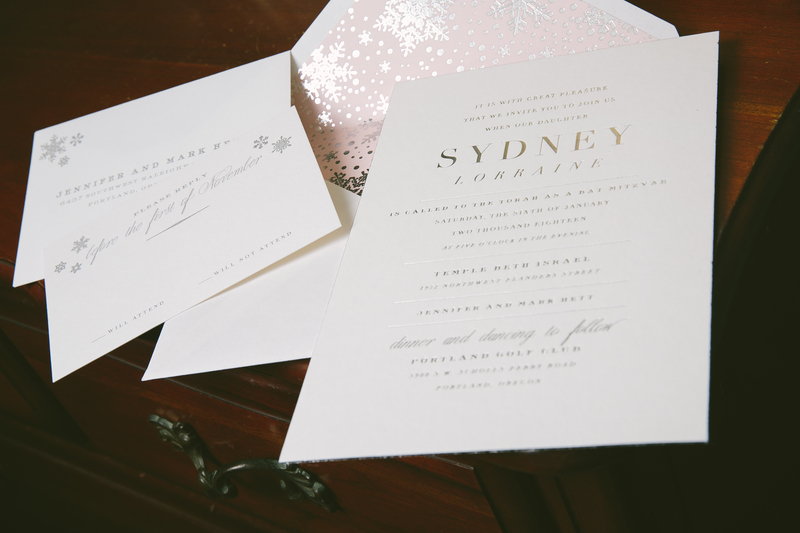 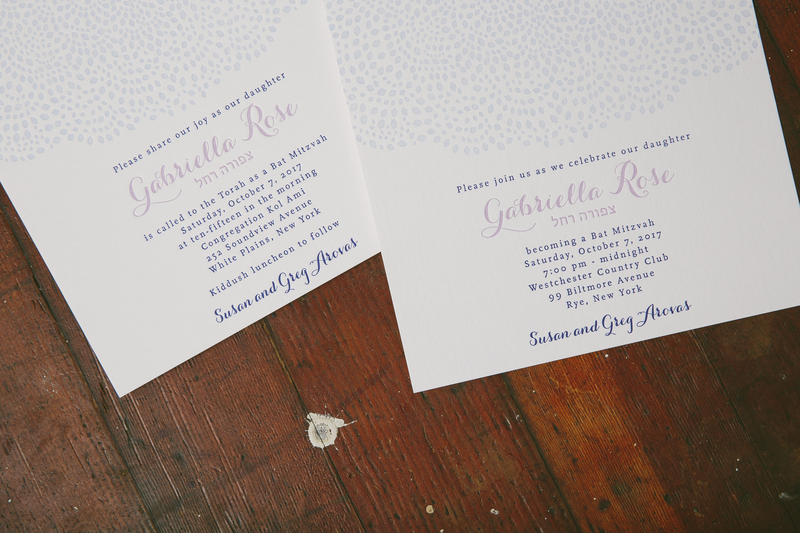 We worked with Uptowne Papers to create these silver foil stamped Bat Mitzvah invitations that are perfect for any wintry affair. 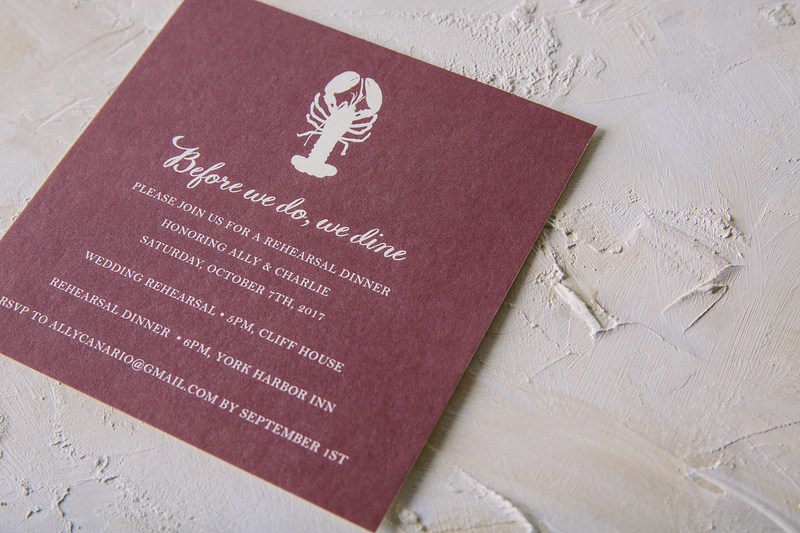 They decided to add a little glimmer and shine to our Exeter design while keeping the reply card and reply envelope a bit more subtle with our Silver letterpress ink color. 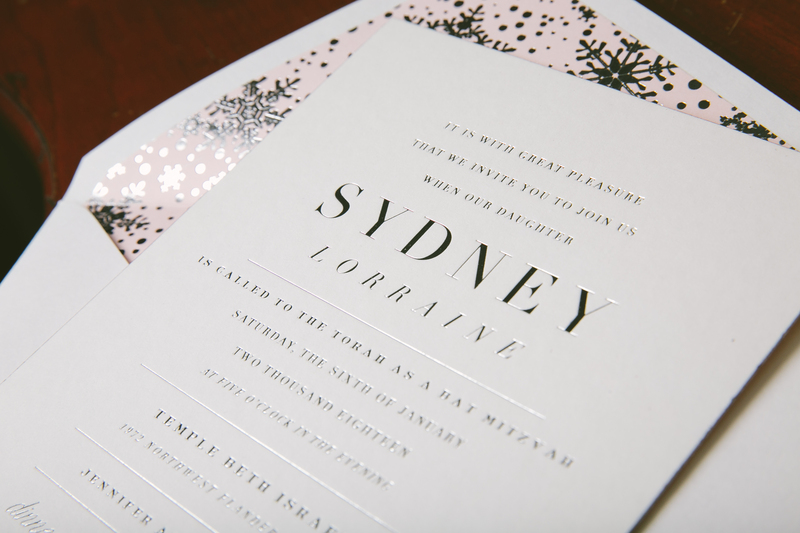 Little snowflakes were added as yet another wintry accent. 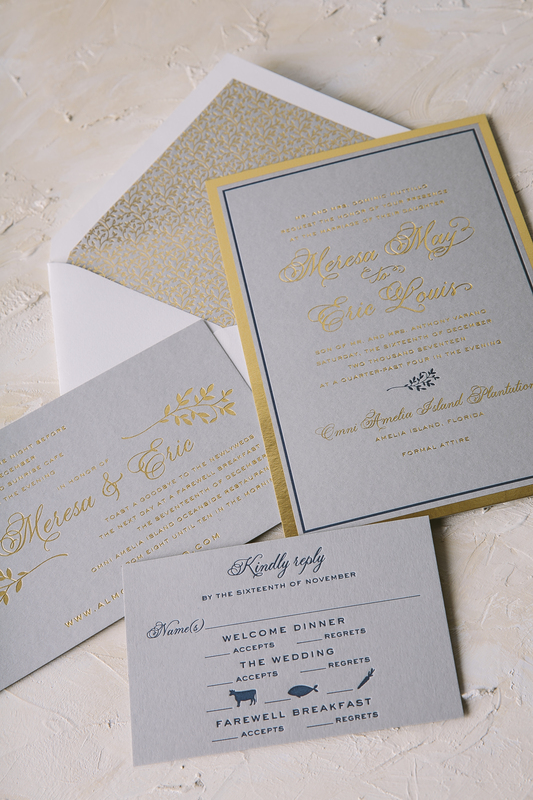 To give the suite an extra special factor, we created a custom envelope liner pattern with Silver Shine snowflakes and a pearl background. 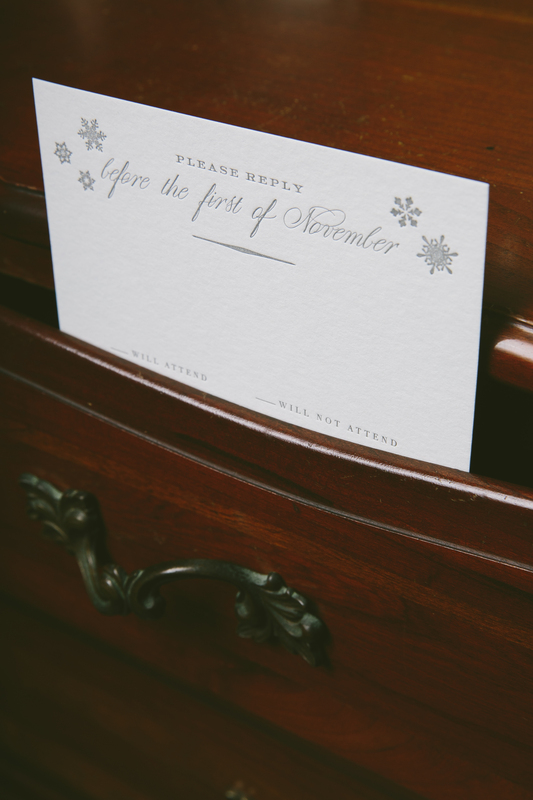 The minute any guest opens their invitation, they will know right away that they are in for an elegant yet festive time! 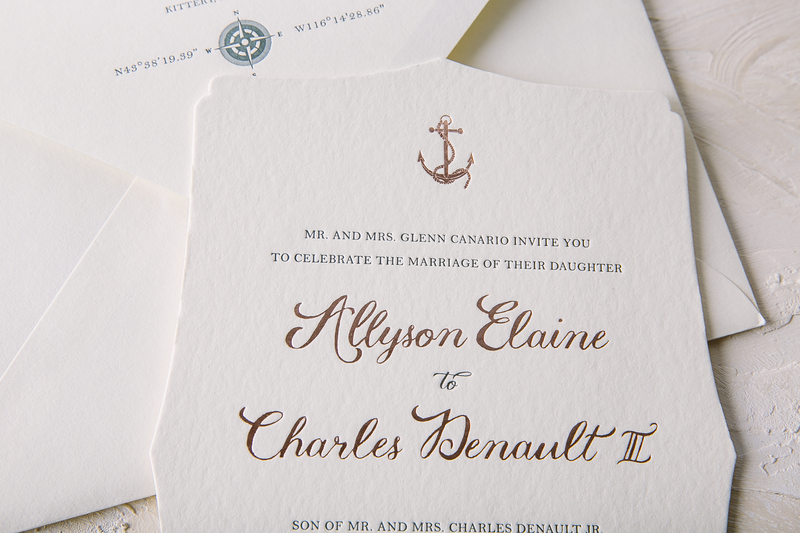 Take elegance, add a touch of nautical flair, and you’ll find Katherine and Matthew’s suite as the beautiful end result. 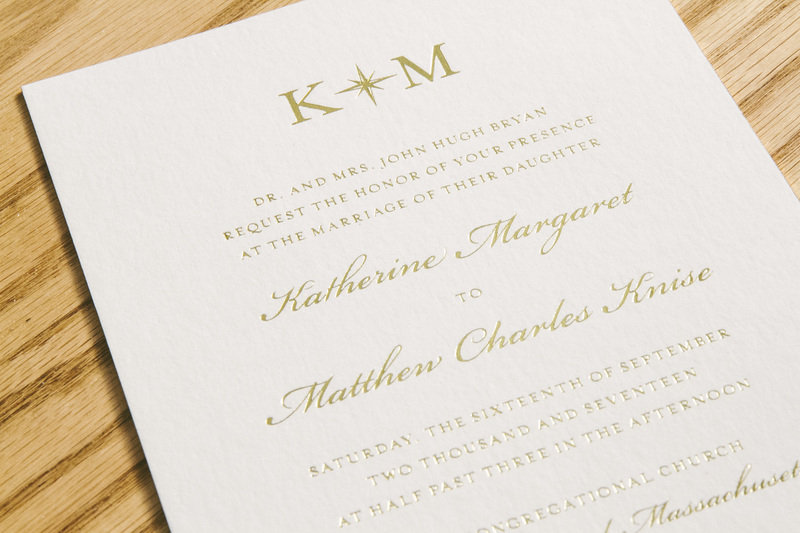 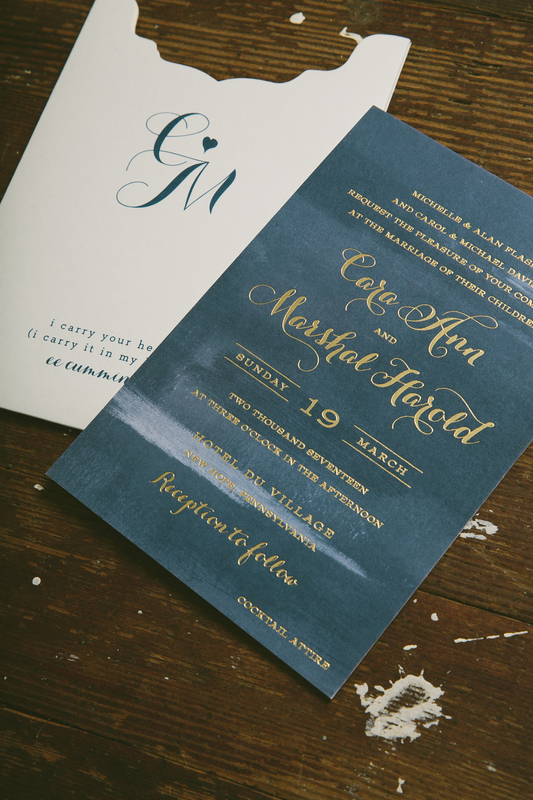 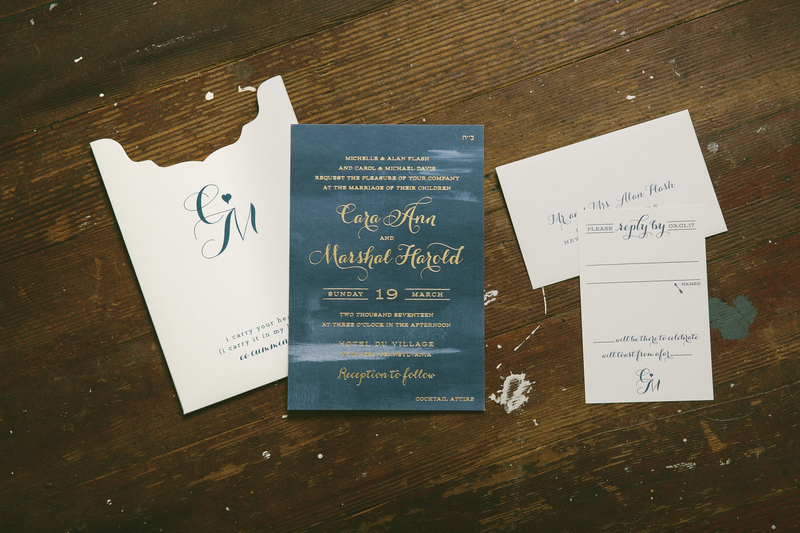 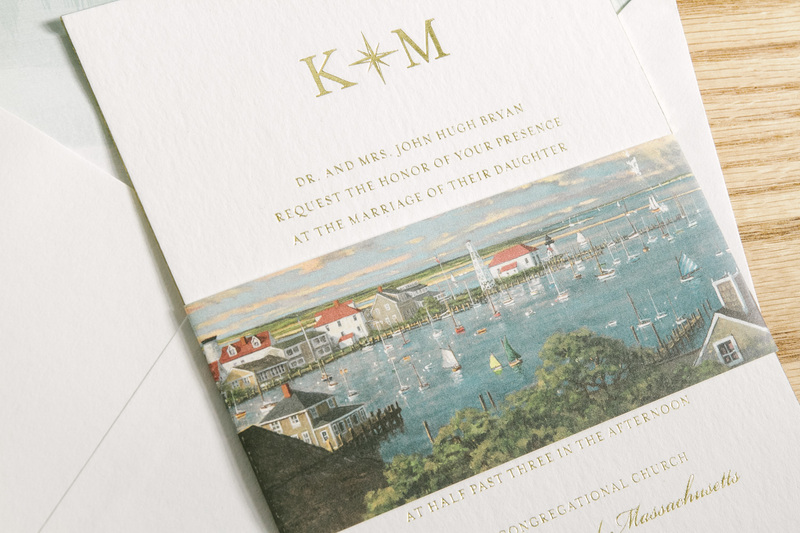 You can never go wrong with classic gold foil stamped wedding invitations, but this couple decided to add their own twist by including a belly-band featuring an exquisite painting of Nantucket Island. 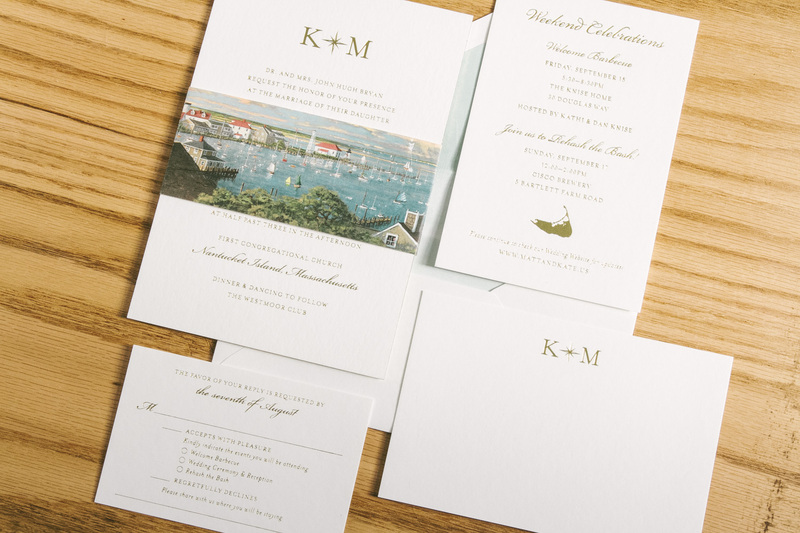 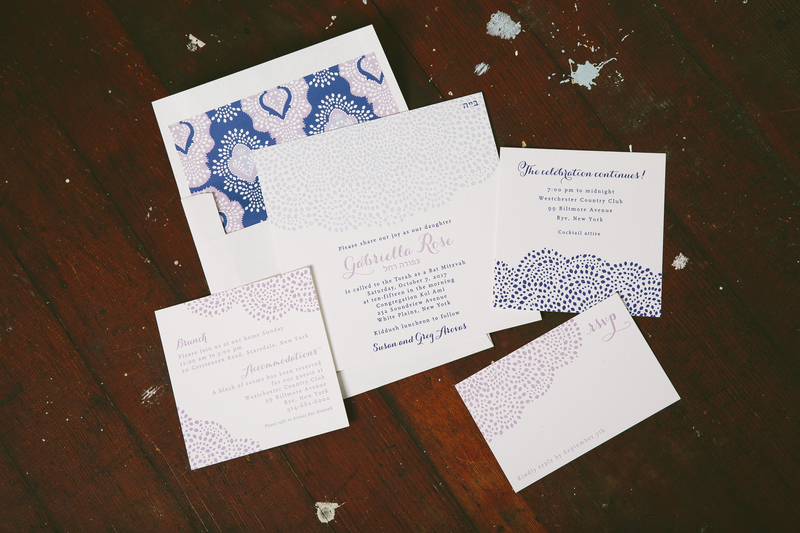 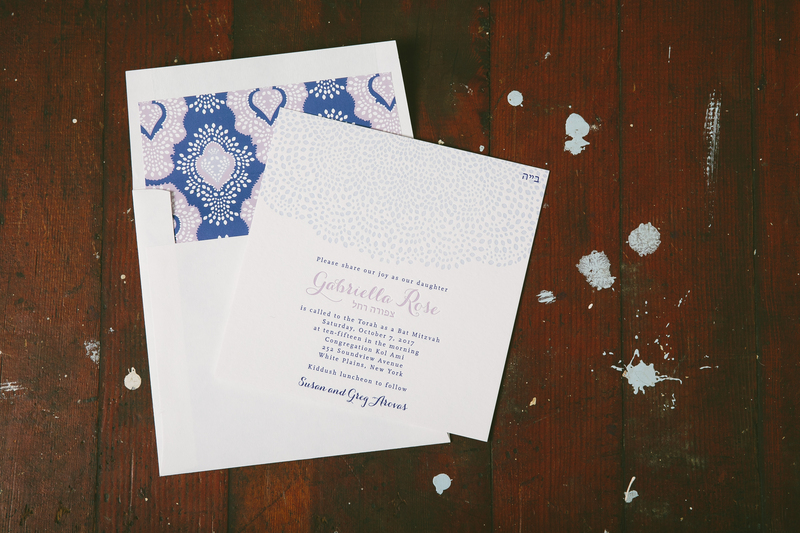 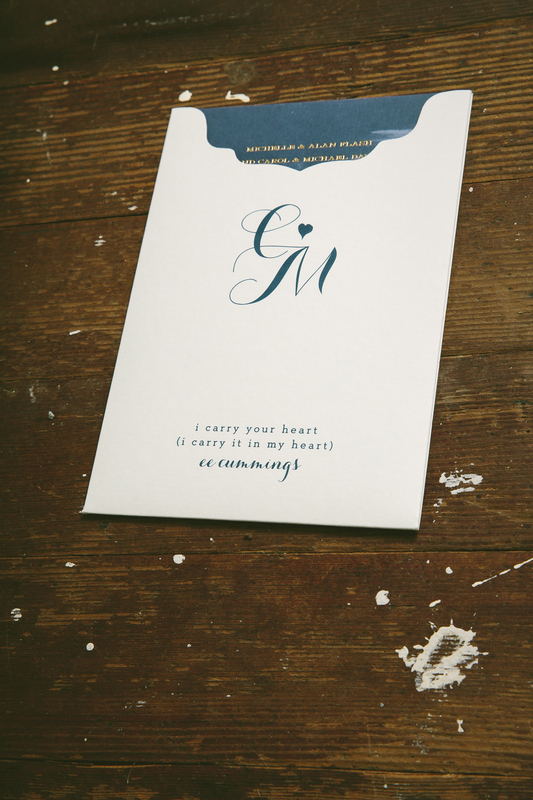 The suite included other nods towards Nantucket like the motif of the island on the weekend celebration card and the nautical monogram on the invitation and thank you card. 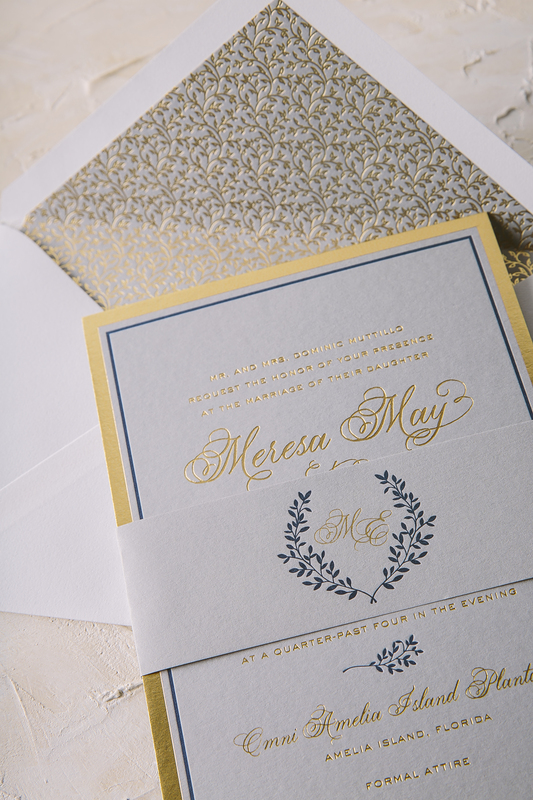 These kinds of accents made the suite harmonious in an incredibly tasteful way thanks to the help of Parchment Fine Papers. 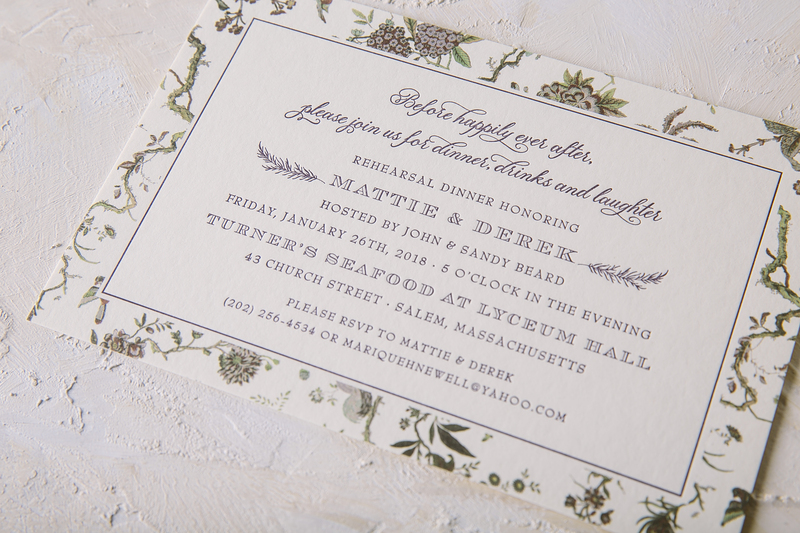 The watercolor envelope liner printed in Sea Mist was yet another subtle yet complimentary means of tying everything together.